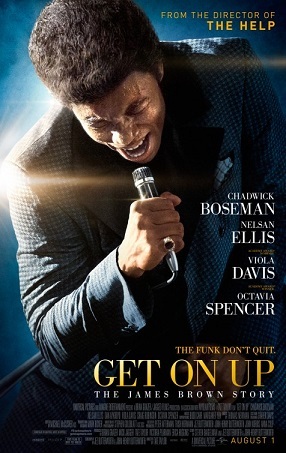 Universal Pictures releases Get On Up on August 1st, 2014. NYC MOVIE GURU: Brian and Mick, how did you you end up producing Get On Up? Brian Grazer: I convinced James Brown that I should make his life story and make it into a movie, and then owned the rights for 12 years. In those 12 years, I had to continue to renew the rights with James Brown directly and hired different screenwriters and, once upon a time, a different director. When James Brown died, I lost the rights because things became further complicated and a year later Mick Jagger ended up with the rights. He and I later agreed to do the film together. Mick Jagger: It was much easier for me than for Brian. Brian did all this work in the long distant past, and obviously it was very complex. It was simpler for me because I was asked by a business associate and friend, Peter Afterman, if I would make a documentary about James Brown. I woke up and said, "Lets do a feature," but of course being in Hollywood there's always a feature. Brian and I and, slightly later on director Tate Taylor, had to convince the studio that this was a movie that should be made. It was a really good experience for me. Then I learned of the script and I learned of Brian's previous involvement, so that's the short version of how I got involved. Actually, in Hollywood terms, from the beginning of my involvement to this point of having the premiere of the movie on August 1st, it's been a relatively short time to get it done. Since we started on the second part of the journey, Brian had done all this hard work in the beginning, but since we started the second part of the journey, in Hollywood terms its been really quick. NYC MOVIE GURU: What is one business that James had created that surprised you both? Chadwick Boseman: The most surprising venture was the James Brown fruit stand. It was part of him wanting to recycle money within the black community before it goes outside of the community to build. It actually was a genius idea. It obviously is not still around, but that was the thing that was the most surprising for me. Dan Aykroyd: I would say nothing that James did entrepreneurially would surprise me. He was just so broad ranging in terms of his understanding of business, how to handle people, how to handle money, how to balance a book, how to make a tour more profitable than any other artist, and so he extended it into the radio stations and the merchandising. He just got it, and he got it from a very early age. NYC MOVIE GURU: Octavia, did you channel anyone from your life to get into character? Octavia Spencer: There was very little channeling that needed to take place in order to understand what she was providing for him. James Brown was definitely a music icon and for those of us who are barely 40. There was so much about the man in front of the music that I knew, that I realized when the whole idea about doing a movie about him, I knew so little about him as a person. We know how the story ends, but not perhaps how it began and maybe a little bit of the middle. But I was really intrigued by that and the fact that you have this icon in Mick Jagger, this icon in Brian Grazer, and the genius of Tate Taylor, that I really had to muscle my way in there. MG: My recall of it is about 50 years ago. My recall of it is not perfect. Will you forgive me? But it was a very exciting show. James Brown was at the Underneath the Stars show but there were many people at the show that were interesting to me, for the first time. I'd never met Marvin Gaye before, for instance. I got the opportunity to chat with him. There was a lot of us on the show. It was a pretty crazy day. I'd seen James Brown before one time at the Apollo, and the experience was James was a bit annoyed about not being the last on the show, and as I was the only one that met him before, of all the people working on the show, including the producers of the show, whoever they were. I have no idea who they were. I was the fall guy, because I was like 20 or something so they said “You go talk to him, you know him, you go call him out." And when you're 20 you say “Sure”. Now it's, “That's not my job, that's your job." When you're 20 you go, “sure”. Of course it didn't work. It might have somewhat assuaged him, but it played out and it was what it was. He did this amazing performance and we went on after, but in the end I don't think it really mattered. We had to work harder, and he worked harder, and maybe it was a better show because of it. NYC MOVIE GURU: Mick, how did your experience meeting James Brown influence you? MG: He influenced me a lot. Among a lot of other people, he influenced me in lots of ways. I could never do the dance routines like James Brown, and I never spent the time and effort that Chad had to do to do the fantastic job that he does in this movie of doing that, because I didn't want to be an imitator of that. But the thing about him that impressed me, as with other people that I was influenced by at the time, Little Richard being the other one, who is in this movie as well. Both of them from very similar parts of the world, and that, how to interact with an audience, the most important thing. I'm sure that Chad got into some of that into making of this movie because it's all about, James was all about interacting with the audience, it wasn't just your performance; it's about their performance too. It's about how they perform and they react and you react to them, the interplay. NYC MOVIE GURU: Chadwick, what was challenging for you about playing James Brown? CB: The entire thing was a challenge. When I looked at the role, the reaso I was a bit scared was that there was no part of it that was just straight-forward, easy, you've done that before. A lot of people will say "Where your from, South Carolina?” but he's from the low country of South Carolina. It's not the same thing. I've spent quite a bit of time out of South Carolina, so it was important to me, we went down to Augusta to meet the family, and stayed because augusta is pretty much on the border, between Georgia and Couth Carolina, I stayed down there a little bit longer, and just drove around, saw the family and soaked up as much of it as I could before we started. This was right before we started. 60% of my fear was from the dancing. 30% was just the caricatures that have been projected of him and trying to get past what people think they know, but I don't think there was any easy part. NYC MOVIE GURU: What were your earliest memories of James Brown's music? Jill Scott: I remember living on 22nd and Lehigh Ave and someone was playing "I’m Black and I’m Proud." I can’t remember how old I was, but I’m pretty sure I was in elementary school, and I remember he was at the stoplight and the music was blaring, and I remember something in me stood up a little but higher. I puffed my chest out listening to that song. That was the first James Brown feeling that I really remember. Tate Taylor: For me instead of one song, it brings a memory. I primarily lived with my mother and she loved James Brown. He was on her record player a lot as a child and it shaped me. When we started filming the movie, she brought me all her James Brown records, and I had forgotten that she used to play them. It made me think of her challenges and James' challenges. It was kind of cool that she listened to his music. MJ: The ‘Live At the Apollo’ Album was my kind of real introduction into James Brown, I loved every tune in it and knew them all backwards. I've never seen him perform, but I imagined the whole thing in my head. Nelsan Ellis: My grandpa used to play 'Say It Loud — I’m Black and My Proud' and it made me feel proud to be Black. BG: When I was in high school, I was in a lowerider car club and I just played James Brown over and over and over again on my 8-track. I loved "It's a Man's World" and "I'm Black and I'm Proud." DA: 1968. Montreal, Canada. The building is gone now, but it was called the Esquire Show Bar. You sat at the bar and the performers danced along the bar. So when Danny Ray came out and they dropped the cape on James Brown and he did "Please, Please, Please," that was a seminal moment for myself and my six friends who’d squeezed into our friend’s mother’s Mustang and come down from Ottawa to see this show. OS: I'm a child of the '70s and we were a James Brown household, but what really resonates with me ... perhaps the stuff of the '90s like "Living in America." I love all of the early stuff, but what I like is that his music transcended age groups and he was able to stay relevant throughout.